ECA, working in collaboration with Florida Gulf Coast University, has completed a two-year study of oyster reef habitats in the Cocohatchee estuary. Research results are being used to plan for environmental restoration of oyster reefs at targeted sites. Why restore oyster reefs? Oysters perform important environmental functions in estuaries: they are highly efficient at filtering water, and oyster reefs serve as a refuge (or home) for shrimp, crabs, and fish that live in the Cocohatchee ecosystem. Research has shown that oyster reefs in Southwest Florida have decreased significantly since the 1960s. How will ECA and FGCU restore oyster reefs? 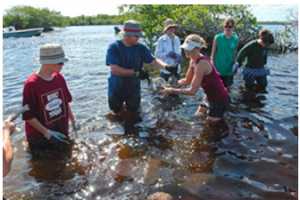 With help from local community partners and sponsors, ECA hopes to build on FGCU researchers success in restoring reef habitat by engaging local volunteers to place bags of oyster shell material in specific areas where environmental conditions are optimal. Oyster larvae, or “spat” thrive when they attach to the shell reefs. How can you help? ECA is seeking local community sponsors to help share costs of a demonstration project designed to increase awareness about the need to restore and sustain the environmental health the Cocohatchee estuary. In addition, ECA is recruiting local volunteers to help with the transport and placement of shell bags in the estuary.